Star Hydraulics & Pneumatics, LLC. builds three types of manually operated pumps - single piston pumps, two-speed pumps, and double-acting pumps. Pumps with 4-way valves are also offered. Your application determines which type of pump to select. At Star Hydraulics, LLC our pumps are robust, solidly built by combining established designs with some of the latest equipment meticulous workmanship and high quality standards. In fact, one of our customers was kind enough to return a pump to us after being used for more than 40 years and it looks like it was almost new. 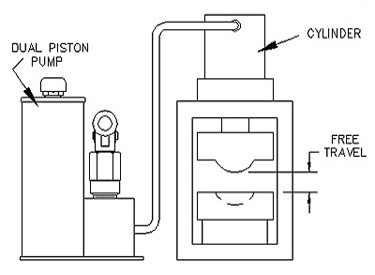 If there is a constantly applied load, such as a cylinder raising a heavy weight, use the single piston pump or the double-acting pump. 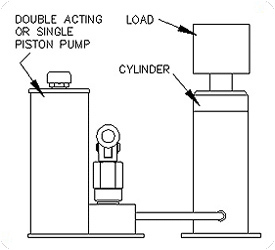 If there is initially little or no resistance, but high force is needed later, use the two-speed dual piston pump. An example of this would be a press in which a cylinder advances until it contacts a load and then applies a much greater bending or cutting force. The dual piston pump supplies high volume, low pressure flow until the increased force is needed, at which time it automatically switches to high pressure, lower volume. 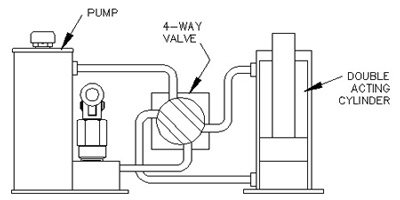 If the application calls for a double-acting cylinder, which exerts force in either direction, use a pump with a 4-way valve. Light hydraulic oil is recommended for use with Star Hydraulics, LLC pumps. Oils with SUS viscosity of 75 to 150 at 100°F will give satisfactory performance (ISO grade 15, 22, or 32). In an emergency situation when above oils are not available, use 5w or 10w motor oil or automatic transmission fluid. Unless there is a specific need to do so, Star pumps are shipped without oil. A Star pump is well-made and robust. It is expected to work in tough environments. Because of that exposed surfaces of standard pumps are painted with industrial quality paint. Pumps painted with special colors with two coat finishes, or with prime coat only, and pumps with special plated or polished parts are also available. In order to provide for continuing product improvement, Star Hydraulics,LLC may make design changes that affect the data provided on this web site. Contact the factory for the most current specifications. It is important to keep the pump clean and well-maintained and follow operating guidelines for best operation and longevity. It is best to keep the pump clean and keep foreign materials away from the piston area so that the surface does not get damaged. Use the proper oil and do not let the reservoir run dry. Do not exceed the pressure ratings on pumps that do not have an overload relief valve and take care when adjusting or re-setting pumps that have an overload valve. If you find that you need to replace the seals on a pump, Star provides repair/replacement kits for each pump along with service instructions on how to replace the seals. If you find that you need assistance during this process, please call us. Star Hydraulics also provides a repair and rebuilding service for all of our pumps. Just call our customer service to get the return information to send the pump(s) back to our factory. Star works closely with distributors of our hydraulic products and can put you in touch with a distributor in your area to purchase the accessories necessary to set-up your hydraulic system. If you have special requests, we will be happy to assist you with these accessories. when you press the calculate button of your choice.